There are several ingredients you can use in cocktails that give them a red tint. 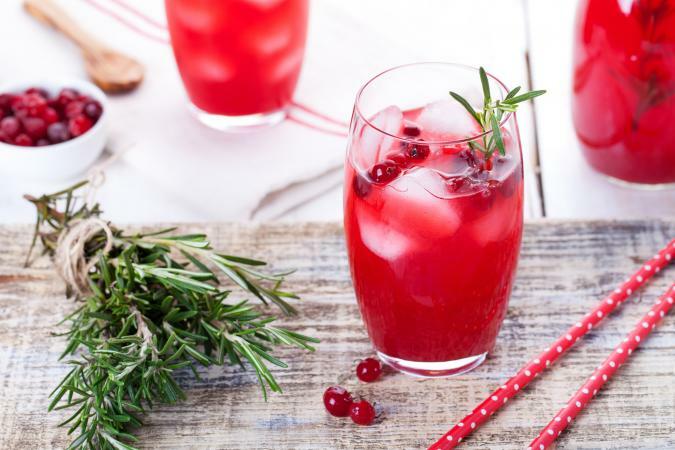 Cranberry juice, pomegranate juice, and grenadine are among these, and you'll find them in a number of tasty red cocktails. This cocktail takes a little prep; you need to make some rosemary simple syrup first, but it gives the cocktail a delicious herbal flavor that makes the few minutes of extra effort worthwhile. The recipe makes one cocktail. Heat 1 cup each of water and sugar with three rosemary sprigs on medium-high heat until the sugar dissolves. Bring to a boil and remove from the heat. Steep for 30 minutes, remove the rosemary, and cool the syrup completely. You can refrigerate or freeze leftover syrup in a tightly sealed container for up to one year. Add the cranberry juice, lime juice, gin, and simple syrup. Add soda to top off the glass and stir. Garnish with a sprig of rosemary and cranberries. 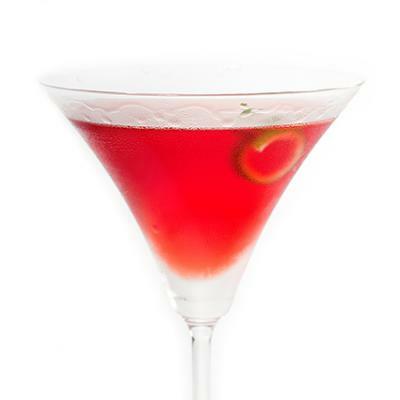 The rubytini is a semi-sweet martini that has a lovely red color with a nice hit of both sweet and sour. This makes one cocktail. In a cocktail shaker, combine the pink grapefruit juice, lime juice, vodka, and grenadine. Shake to chill and strain into a martini glass. This delicious cocktail features the flavors of pomegranate and dark berries along with a hint of acid from lime juice. It makes one cocktail. Add the pomegranate juice, lime juice, Chambord, cardamom bitters, and vodka. Stir to combine. 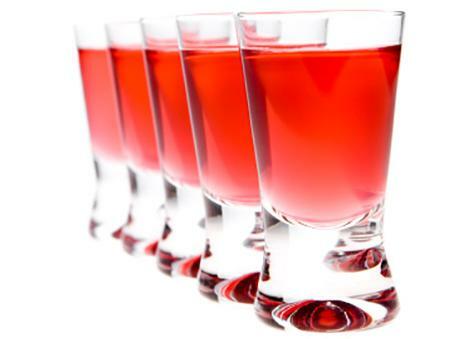 If you love apples and cinnamon, then you'll love this red tinted shot. It makes two shots. In a cocktail shaker, combine all ingredients. Shake to chill. Strain into two 2-ounce shot glasses. Along with the original red cocktails above, you can find plenty of other cocktails with a lovely red hue. Cocktails made with the berry liquer, Chambord, tend to be red hued. A French martini, made with Chambord and Champagne, is red. The sweet and sour drink, Grateful Dead, is boozy red bliss. Drinks made with grenadine and gin have a red hue as do beverages made with grenadine and rum. Some firecracker cocktails are red. A tasty tropical hurricane is red as well. One of the best known red drinks is the Cosmopolitan. 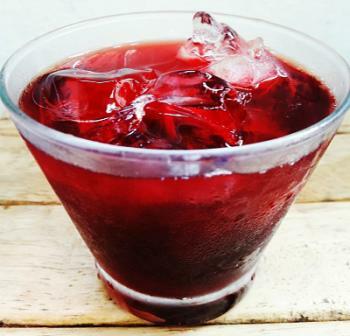 Want a red drink to feed a crowd? Wine and vodka punch is just the ticket. If you love the sweet, tarty, fruity flavor of Jolly Rancher candies, then try the red watermelon Jolly Rancher cocktail. A savory bloody Mary is a classic cocktail that's red. Love strawberries? Try a strawberry daiquiri or a virgin strawberry margarita. A tequila sunrise combines red and orange in a beautiful layered drink. A pomegranate margarita is a lovely twist on the typical margarita. Sangria combines red wine and fruit in a refreshing red beverage. Looking for something warm and fragrant? Try mulled red wine. Using red ingredients from watermelon to berries and everything in between yields tasty, beautiful red cocktails. Use your imagination and find tasty red cocktails for every occasion.